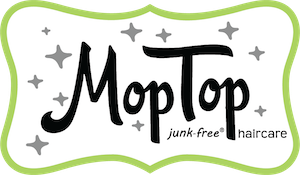 To answer your question, the MopTop salon-grade Daily Conditioner (12 oz or 32 oz) is GREAT for 2B hair, depending on length and density. - Remember - a little bit goes a LONG way. - If you normally leave in some conditioner, do so sparingly with the salon-grade Daily Conditioner until you understand how it performs with your hair, as the consistency is thick and luxurious, and you would not want to leave too much in.